Dorm room bedding - sports bedding. Roll Tide! 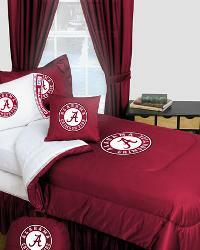 Great for any 'Bama fan, a FANtastic selection of NCAA bedding featuring the Alabama Crimson Tide. This college bedding set offers 3 choices of bedding along with a sheet set, drapery and curtain panels, valance, wall border, shower curtain and throw pillows all with the Tides colors and logos to help show your team spirit. Wooo Pig Soooie!! 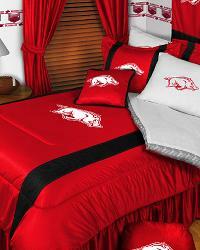 Cheer on the Hogs and show your spirit even in your sleep with these great looking college bedding sets with coordinating team accessories. Several different Arkansas Razorback bedding sets are offered which include a bed in a bag set, a comforter set, locker room as well as sidelines bedding. A great mix of coordinating collegiate decor is offered to help complete the look of your room. Go Orange and Blue and hear the cry of the "War Eagle!" 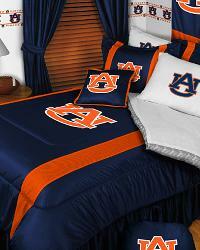 Auburn Tigers Bedding adorned with the college team logo and colors is the perfect addition to any sports fans bedroom. This great college bedding offering includes the Auburn Tigers comforter set, matching sheet set and throw pillows as well as curtains and draperies as well as matching valance, shower curtain and more. 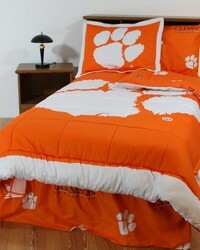 Sleep well at night in your officially licensed Clemson Tigers comforter set after watching the Tigers pounce their latest victims in Death Valley. Be a little Devil and show your support with these one-of-a-kind bedding collections. After watching the Blue Devils put a full court press on their opponent rest well in your new Duke comforter set. 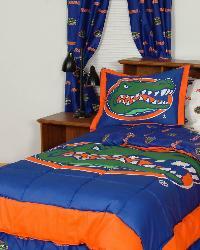 Show your Gator pride in the 2006 National Football Champs with a Florida Gators Bedding Set. Adorned with the Gator logo and orange and blue colors these sets are sure tp please the Gator fan in your life. Show that Seminole spirit with these great officially licensed Florida State comforter sets. Adorning the Chief Osceola logo, these bedding sets will get your ready to put on your war paint and do battle. Bring Uga and the infamous oval "G" into your home as you show your school pride everyday with these great looking comforter sets. 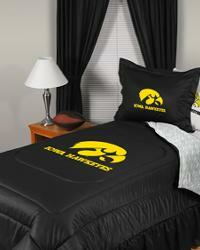 Black and yellow with the distinct Herky the Hawk logo are displayed prominently on the FANtastic college comforter sets. Go Cyclones! Adorning the Iowa State logo, these officially licensed NCAA comforter sets will look great in any Cyclone fans room. 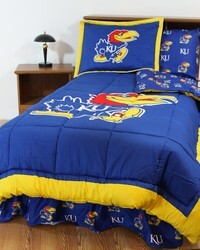 Make Jayhawk pride alive in your bedroom. One-of-a-kind Kansas Jayhawks bedding in the vibrant blue and red school colors with the Jayhawk logo perched for the world to see. KSU Wildcats are on the prowl. 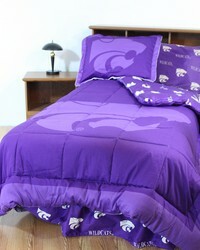 Show your school spirit for the purple and gray with a FANtastic comforter set adorning the Willie the Wildcat logo. With a winning basketball tradition you can't help but be proud to be a Wildcats fan. 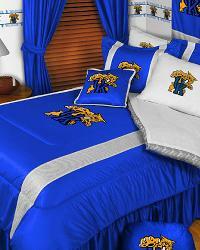 Show your spirit with a comforter set adorning the wildcats logo. 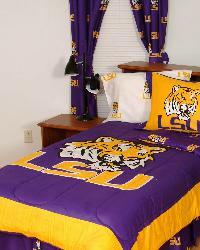 Cheer on the 2008 National Football Champs and their winning tradition with these vibrantly colored comforter set. Go Green and White! 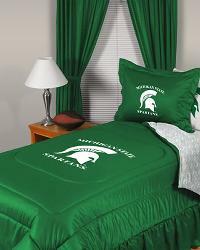 You may not have Sparty to help show your team spirit but a Michigan State Comforter will sure do the trick. 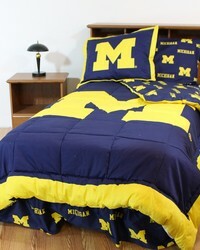 Show your Big 10 and Michigan Wolverine pride by adorning your bedroom or dorm room with an officially licensed comforter set. Support the Nebraska Cornhuskers and their long standing tradition of Championship calibor teams. Hope your house isn't made of straw because the Wolfpack is coming to blow your house down. Officially licensed NCAA comforter sets adorning the NC State logo and school colors. Dress your bedroom in Carolina Blue and watch as the Tar Heels run the hardwood and try to win another NCAA National Championship. The Buckeyes have become a Big 10 powerhouse. Show your Ohio State pride with an officially licensed NCAA bedding set. Boomer Sooners! Watch as the 2006 Southwestern Conference Football Champs roll into town. Dress your bedroom for the big game with any of these one-of-a-kind bedding collections and accessories. Welcome to the Lions Den! 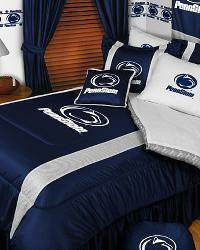 PSU bedding collections and accessories adorning the Nittany Lions logo and school colors perfect for any Penn State fan. Watch out for Cocky and that team of Gamecocks as they take to the grid iron. 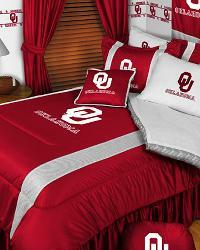 Officially licensed NCAA bedding sets will spruce up any bedroom or dorm room. Go Vols! Cheer on the Orange and White and the 2007 National Women's Basketball Champs. 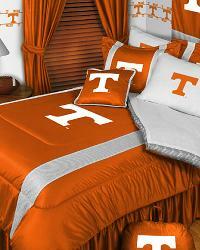 Tennessee Volunteers bedding make the perfect addition to any sports room. Go Aggies! School spirit will stay alive in your bedroom with a Texas A&M bedding set complete with the A&M logo and school colors. Hook 'em Horns! Texas Longhorns bedding sets and accessories adorning the team colors of this reputable Big 12 school. Be ready to ring Bertha, the Saddle Tramp Bell on game day as the Red Raiders ride in ready to battle. 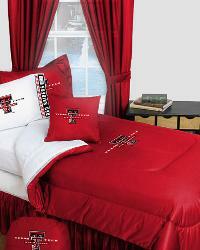 Officially licensed NCAA bedding sets adorning the Texas Tech logo and raider red school colors. Deep rooted in tradition and excellence, the West Virginia Mountaineers are a Big East powerhouse. Show your Mountaineer pride with a bedding set adorning the WVU logo and gold and blue school colors.